The second 911 GT3 R fielded by KÜS Team75 Bernhard retired in lap four after an accident. The race car from Weissach was driven by Klaus Bachler (Austria) and Belgian Adrien de Leener. “After the first safety car phase I was hit from behind and that broke the steering rod. It’s a shame because we’d started the race well,” explained de Leener. “It was a day of mixed fortunes. Timo Bernhard and Kévin Estre drove a strong race and made the most out of it. If it weren’t for the penalty, they would have finished further up the field. With Precote Herberth Motorsport we have to look at what happened. IronForce by Ring Police improved after the qualifying and made up several places. This shows that the pace is good. All the teams have worked at a very high level. On Sunday we would like to take another step forward,” said Marc Lieb, Head of Customer Racing. Round eight of the ADAC GT Masters takes off on Sunday, 5 August, at 13:08 hrs. 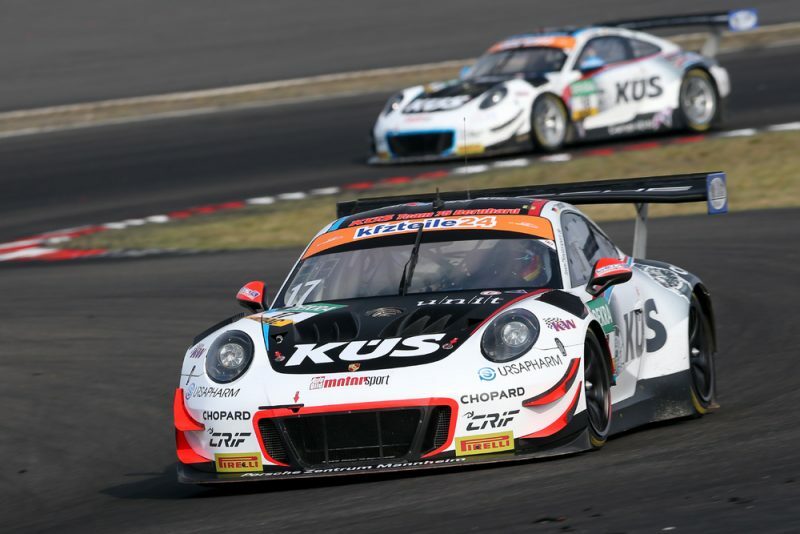 The grid positions of the three Porsche customer teams KÜS Team75 Bernhard, Precote Herberth Motorsport and IronForce by Ring Police are determined in a morning qualifying on race day. The 30-minute session begins at 8:30 hrs. The race is broadcast live on Sport1 as well as on the internet at www.sport1.de, www.adac.de/motorsport and www.youtube.com/adac. Contesting the series alongside Porsche are the likes of Audi, BMW, Corvette, Ferrari, Honda, Lamborghini and Mercedes-AMG.